Birthday parties!! They have become bigger and pricier since my sweet days of paper crowns and kids meals at Burger King. My daughter, M, and I were dreaming up what would fit her personality and passion for a 9-year old sleepover party with friends. Locally we've had all sorts of group painting stores and party places open up. These are fabulous for unique get togethers, and they are also a little more than we could afford so we decided -- Let's do our own You Paint Party. 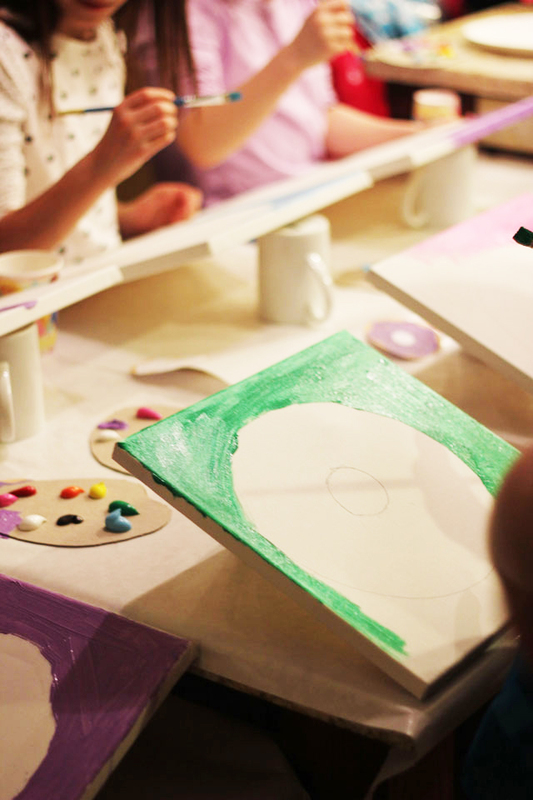 It began with the 2 inch canvases that M painted for invitations. She embraced the abstract and each one became its own masterpiece. We glued event details to the back and mailed them out. 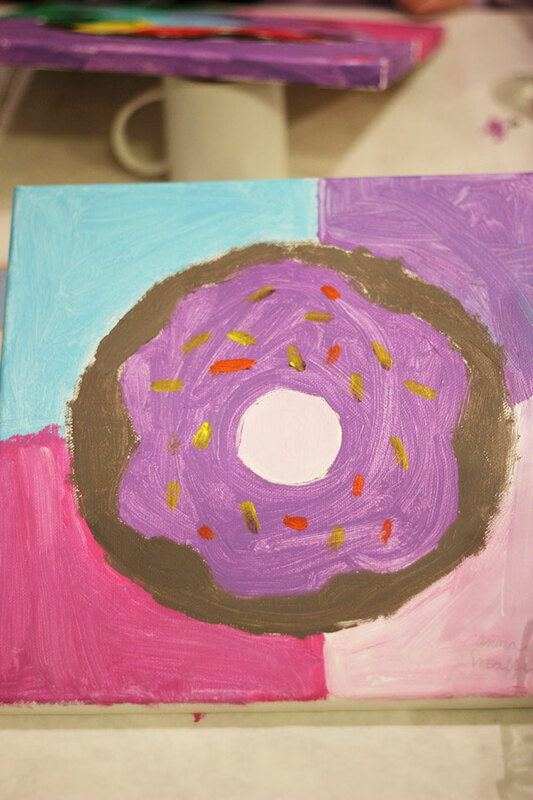 M also loves donuts so we decided that the girls would paint canvases of sprinkled donuts on them. We kept our eyes open for great sales on canvases, and we were able to grab a bundle from Michael's for a steal. We chose 12" squares to accommodate our studio space (also known as our kitchen) as well as ease in transporting after the party. To convert our home into a studio, we prepped the kitchen. Covering the table with freezer paper and removing the chairs was the first step. Creating make-shift easels from canvases propped on coffee mugs worked out perfectly! Each painter received a thin and thick brush as well as a mini palette of paints. 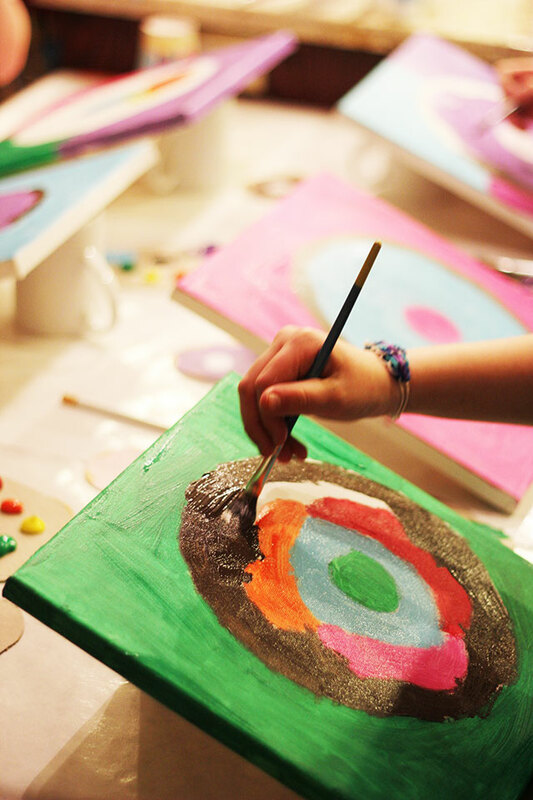 We created our palettes from cardboard sheets, and each artists had her own array to choose from. To make our guests of every skill and comfort level feel ready to dive into the project, we decided to offer some easy guidelines. Paper plates made a handy outline for the outer edge, and the bottom of paper cups become our stencil for the donut hole. We began with the background color(s) first to set the stage, and already personality came through! We then moved onto glaze followed by the cake of the donut. The best part was all the giggling and compliments they lavished on one another. Such a supportive group of painters! The form of a donut is such a beautifully simple one that painters from all backgrounds can own their own sense of style to it! I was amazed at how many variations we had on the same theme, and I loved that no one felt frustrated in trying to make their painting look too realistic. There's something fantastical about donuts, no?